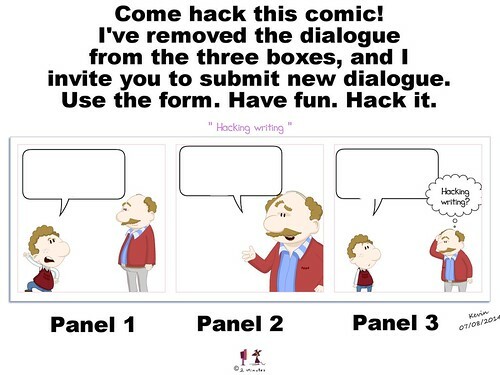 Inspired by all the remixing of Garfield comics, and the back page Caption Contest of the New Yorker magazine, I decided yesterday to remove the dialogue from one of my own webcomics for our Make Cycle around hacking writing for the Making Learning Connected MOOC, and open it up to people to add their own. Call it community hacking. Then, I edited a version in Flickr with the Aviary tool, removing all of the dialogue except for the last line, where the father thinks, “Hack writing?” It made sense to keep this as a sort of “punchline” that everyone could build the comic around. I then went into Google Forms (part of Google Drive) and created a very simple form that people could fill out, and added the blank comic as the image. 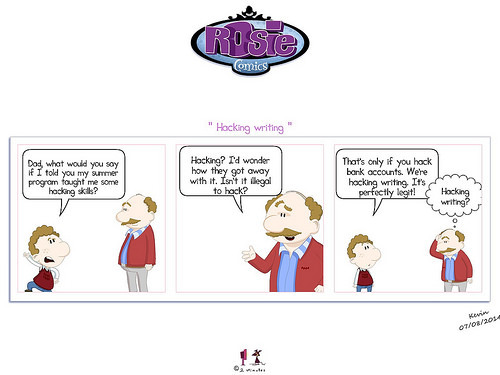 I sent out the links to the form through our CLMOOC network, inviting people to hack my comic, and they did. As dialogue got submitted, I used Aviary again to layer in text and publish the comics, which I then shared out during the day. I’d be remiss not to mention that my friend, Terry, went a step further and created this very fun Dance Party remix with the comic. Love it. How about you? You can add your own lines to my comic, and then I will publish it.